These are SO easy, and I’m going to take you step-by-step through the whole process. Remember the surprise cake I made for Noah a few years ago? That remains one of my favorites to this day. 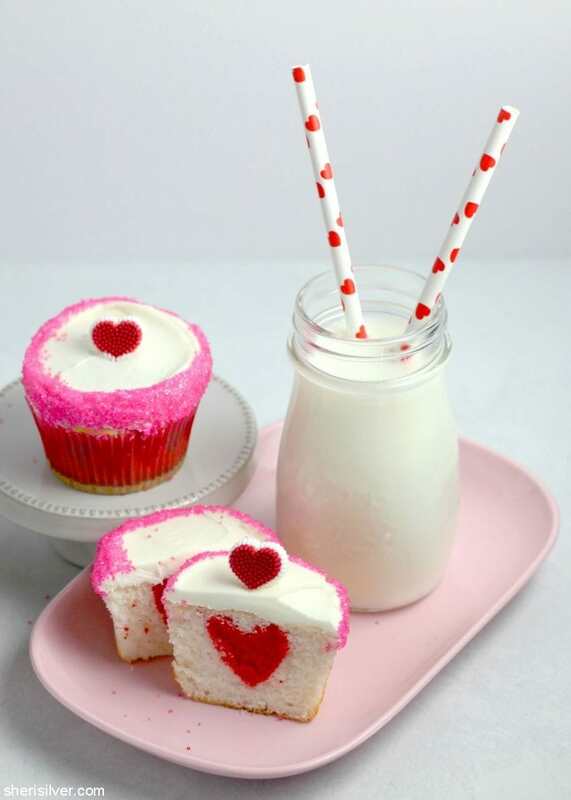 I’ve wanted to do a cupcake version for a while now, and what better time than Valentine’s Day? HEARTS!!!! I simplified this greatly by starting with boxed cake mix – but do you and bake from scratch if you like. Keep in mind that one box will make a dozen surprise cupcakes, so scale up if you need more. 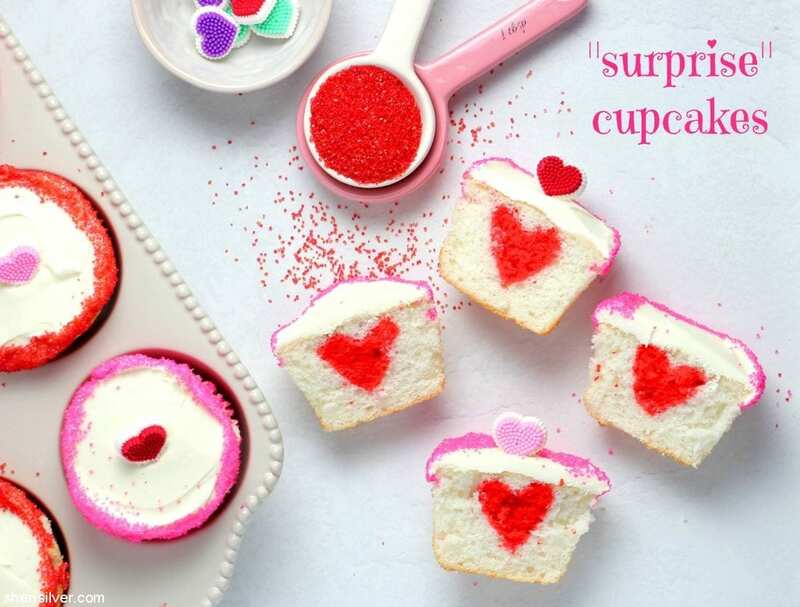 These are easy to customize, and would also make a great dessert to serve at a gender-reveal party, don’t you think? Pre-heat the oven according to the package directions; grease and flour an 8″ x 8″ baking pan. 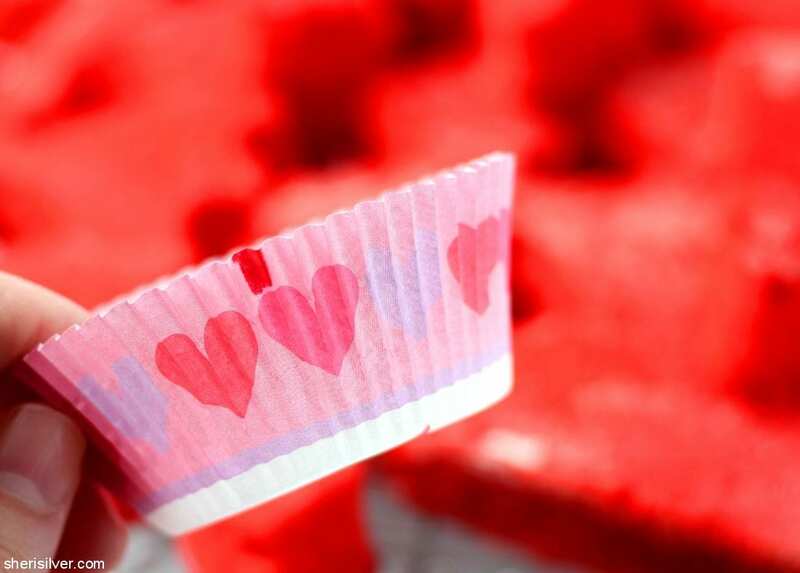 Make a dot on each of 12 paper cupcake liners and place them in a 12-cup tin, with all of the dots pointed in the same direction. Transfer one-third of the cake batter into a bowl and add the red food coloring, stirring and adding more dye till the desired shade is reached. 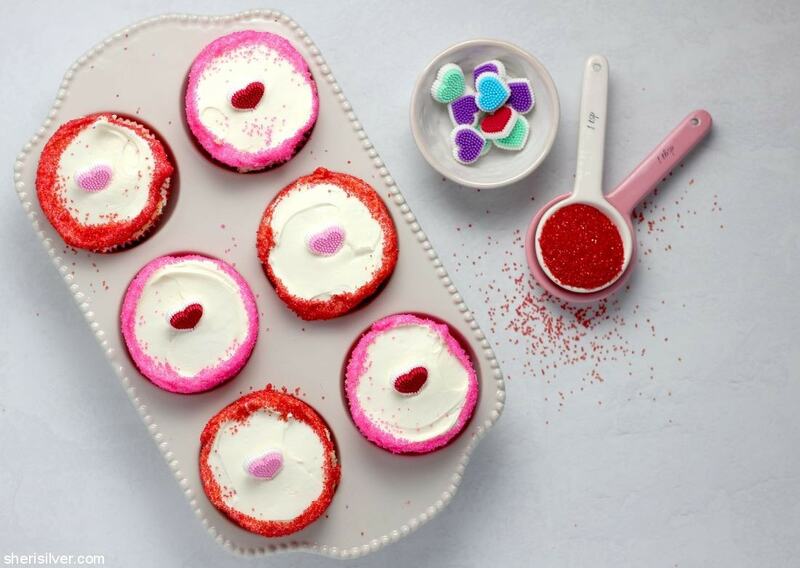 Place the remaining batter in the fridge till ready to use, and pour the red batter into your baking pan. Bake for 12 minutes. Cool in pan for 10 minutes, then transfer to a wire rack to cool completely (pop in the freezer to speed up this process if you like). 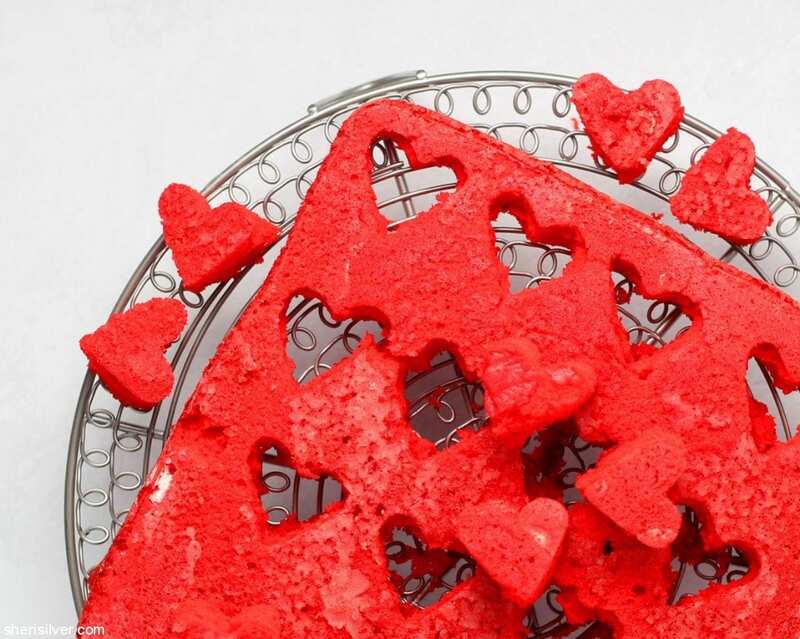 Using a 1″ heart cookie cutter, cut out 12 hearts from the cooled cake. 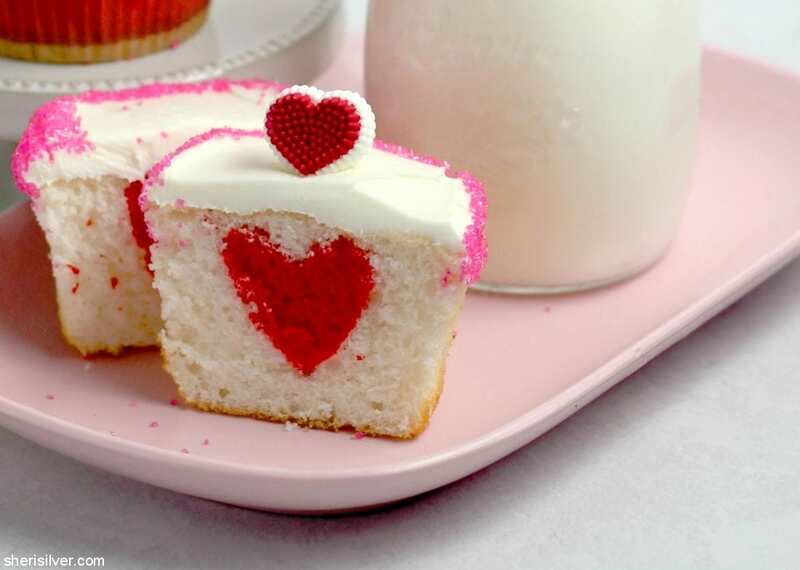 Scoop 2 tablespoons of white batter into the bottom of each cupcake liner and place one heart in each, facing the dot. Carefully pour the remaining batter into the liners and bake for 18 minutes, or till a toothpick tests clean. Cool completely. 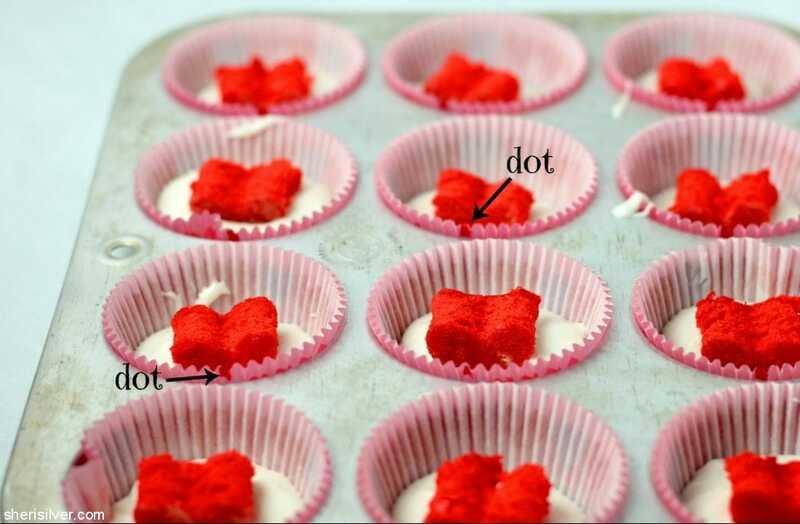 Frost and decorate cupcakes as desired, then place each decor on top so that it is facing the same direction as the dot on the liner. More Valentine’s Day ideas and sweet treats on Pinterest!